The bad news is that approximately 40 million people between the ages of 18 and 54 are currently dealing with some form of anxiety that is more intense than that which is experienced by their peers. The good news is that this issue is manageable without the use of pharmaceuticals, and one of the most effective ways of taking control of your mental state is through the use of cognitive behavioral therapy. 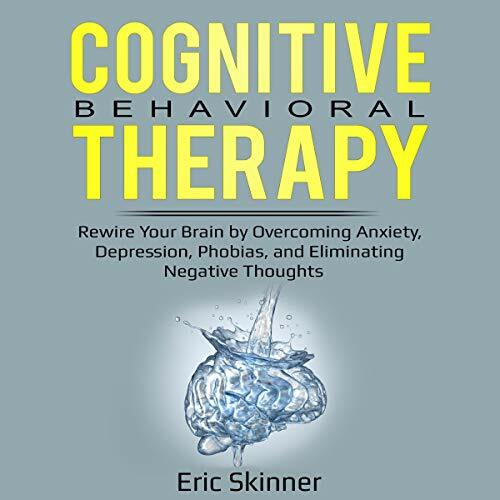 If you are looking for a way to control your crippling anxiety once and for all, then Cognitive Behavioral Therapy: Rewire Your Brain by Overcoming Anxiety, Depression, Phobias, and Eliminating Negative Thoughts is the audiobook that you have been waiting for. First, you will learn all about cognitive behavioral therapy and the many ways it can benefit those who are in your situation. With the basics out of the way, you will learn more about the issues that cognitive behavioral therapy deals with most effectively so that you can be prepared to get started putting them behind you once and for all. From there, you will find a wide variety of starter exercises to help you start dealing with your issues in the moment, as well as a detailed look at mindfulness meditation, what it’s good for, and why you should already be practicing it. Next, you will find a discussion of the bad habits in your life and why getting rid of them will likely do your mental state a world of good. You will also find specific sections focusing on exercises devoted to cleansing the mind of negative thoughts, depression, phobias, and anxiety. Finally, you will find tips for sticking with it in the long-term and ensuring you remain successful throughout. So, what are you waiting for? Take control of your mental health issues like never before, and buy this audiobook today! The differences between the brains of those with severe mental health issues and those who don’t have to deal with those issues. The ways in which your habits are contributing to your mental health issues and how to change them for the better. A wide variety of exercises designed to help you start controlling your issues ASAP. Thought exercises which will make it easier to break free from negative thought patterns once and for all. This book contains brilliant advice from a former sufferer of anxiety, depression, and intrusive thoughts. Inspired by compassion, this book is a gift to fellow casualties of negative thought patterns, destructive behaviors, self-loathers, and those wishing freedom from persistent demons. Only by meeting our demons face-to-face can we hope to prevail and achieve inner peace. This book equips you with the most effective techniques for overcoming depression, anxiety, and intrusive thoughts. These are long-term solutions that have stood the test of time and scientific rigor. I found this book truly inspiring and helpful. It is an easy to follow self help guide to mastering the benefits of Cognitive Behavioral Therapy. The idea behind CBT is that you can change your thoughts and therefore improve your reaction to emotions that you cannot change in situations, helping you with anxiety, stress, and depression to name a few. The most proven method for successfully treating mental suffering is CBT. However, there are also complimentary practices coming from Buddhist and Stoic philosophy. This is an awesome audiobook! A few days ago I have purchased this book and got good tips from here. I really appreciated using this!! Cognitive Behavioral Therapy is something I have been interested in for quite some time. As I struggle occasionally with depression and my husband has a tough battle with it every day, I wanted to know more about something that could help us both. I found this book to be extremely helpful and full of tips, practices and techniques to help dig you out of the hole called depression you may find yourself in. I can’t wait to start implementing some of these things in my daily life. Have you ever read a book, maybe a self-help or a how to book and just stopped reading to start that project? Well reading Cognitive Behavioral therapy made me want to do just that. I wanted to stop at the steps, follow the instructions ad see if by changing my way of thinking I can change my view and I did stop often. I love that it has suggestions on the steps, quotes from different people ad books that you can listen. This isn't a long drawn out book but will get you thinking about how you think.As I read I found myself copying out quotes, deep breathing and even wondering if there was a way to print form my kindle. At the end of the book you will find an included set of worksheets to follow and use for the steps outlined. If you don't want them it tells you how to use a notebook. I really thought it was quite interesting how you can find similar ideas in different religions that may also help you see a more peaceful and positive way of thinking. This book is an excellent resource for anyone interested in improving his or her life by employing the tools of cognitive behavioral therapy. It contains detailed chapters that illuminate a seven step therapeutic process that one can utilize to help ease negative emotions and anxiety. Furthermore, it is listening in a very clear, understandable way that should enable as well as experts in the field to follow and use the information presented in it very effectively. Finally, in addition to providing valuable information it offers a truncated, interesting history of cognitive behavioral therapy. Therefore, if you're looking to enhance your life you should buy this book, it can only make you feel better. The author explains how to challenge our dysfunctional core beliefs, which can be hard. People can tackle these dysfunction core beliefs with therapy, philosophy, mediatation and spirituality. This book seeks to show people how to change their thoughts in order to change their actions. Great listen. Highly recommended. The Author did a very good job in explaining the techniques in overcoming anxiety, depression, fear etc. Powerful men such as Eric Skinner has talked about how thoughts become things as well as we manifest what we think about. This book is a book that will change your thinking if you apply the principles in the book. I loved the way the book was broken down, it made it easy to read and understand. I think everyone should listen this book and apply the principles in it because even if you are not suffering from any of the mentioned ailments someone you know maybe. For me personally this book has made me want to do more research on CBT. It may be taboo for some cultures to discuss mental illness, anxiety, phobias etc. But it is life issues that we can learn to cope with. I highly recommend this book. I found this book particularly helpful. I found this book particularly helpful. I am a special education teacher. I deal with students that have anxiety and behavioral issues. I found this book had many helpful steps I could take in which to help my students understand why they are having their thoughts and behaviors and alo different approaches on how to deal with them. It aimed to help build a set of skills that anyone(without additional monetary resources) could employ in their every day lives to help combat the impact of anxiety and depression on one’s every day living. I really enjoyed this book! It is incredibly easy to follow and the techniques are natural and progressive. I love that this approach affirms our own ability to heal our own mind while drawing on our own strength ("Physician, Heal Thyself") but also encourages openness in reaching out for professional help. Within the book there is respect for natural healing and technique, professional input and also religious principles, so anyone can find something helpful in this listening. CBT is good to know if you suffer anxiety, especially if you don't want to take medications, or your medications aren't really working. I have always heart of people talking about cognitive behavioral therapy, but I never knew exactly what it was, so this book really helped me understand more about it. I'd say it is well made and easy to understand, and it gives some suggestions on how to go about retraining your mind. Though this book didn't specifically suggest this, I am planning to incorporate Bible verse memorization and scripture meditation as a strategy. It has other ideas in it that I personally wouldn't use, but you can really use anything you like to retrain your brain. Anything that motivates, uplifts, and inspires. This book has helped me to understand more about CBT, and I plan on exploring and looking more into it. I found it very useful and interesting! It takes you through each of the seven ways to overcome your anxiety in an informative and interesting way. With easy to follow exercises to help along the way! I worried at first that everything would be too difficult for an average person like myself to follow but I definitely didn't need to be concerned. If you've ever wanted more information about CBT, this book is definitely the best to start! This was my first actual self help book and I found it so interesting. I'm definitely going to look for more books from this author! The main goal of the book is to outline the steps to change. Although helpful, there are too many "what if" scenarios listed. They made me as a listener try to apply all of those different situations to myself. I would rather build my own ideas about the questions in my own mind. It is also possible that a reader with depression or anxiety may become more so by all of the situational examples given. The author could have given them an example of something that they had never thought about before. It could possibly have an adverse affect. Clear, concise, and incredibly interesting! I was thoroughly impressed by how the author captured the essence of what it is like to suffer from anxiety and depression. While his real world examples were sometimes a bit extreme, I think most of us can relate to the strong emotional thoughts that make us feel depressed. The worksheets and step by step instructions on how we can improve the way we think about ourselves were clear and uplifting. My favorite quote from the book is "There are no failures, only opportunities to learn from tasks that were harder then expected." How many times have we set ourselves a lofty goal only to give up after our first try when we don't succeed? I was thoroughly impressed with this book and hope it it helps you too! I've done some cognitive behavior therapy in the past with a therapist and I found that to be very helpful. I hadn't done any of the methods in a while and wanted to do something a little more self-guided. This book (well, e-book in my case) was a good choice on one for self-guided practice. It was easy to read and follow. It had some good insights and helpful information that both reminded me of things I had done in the past and reminded me why I like this type of therapy. I recommend this book if you are looking to try and turn negative/bad/troubling thoughts and behaviors into better or more positive thoughts and actions. I really like this book and the suggestions it gives in helping you to change your mindset. I suffer from severe anxiety and listening this has given me a few different ideas and techniques in helping me to identify my obstacles, take better control of my thoughts, and be successful in taking back control over my life. I think the workbook portion is a huge bonus too because it truly helped me in identifying issues that were contributing factors that I hadn't even considered before. Very helpful book. There is some religion in it but for the nonreligious too. I liked it a lot. Helps sort out your thoughts. Easy to understand and understand.